Formed by the confluence of the raging Lochsa and scenic Selway rivers, central Idaho's Middle Fork of the Clearwater is a gentle rafting day trip. Several Class II rapids add excitement to this beautiful float down the Clearwater, one of the original eight rivers designated Wild and Scenic by Congress in 1968. 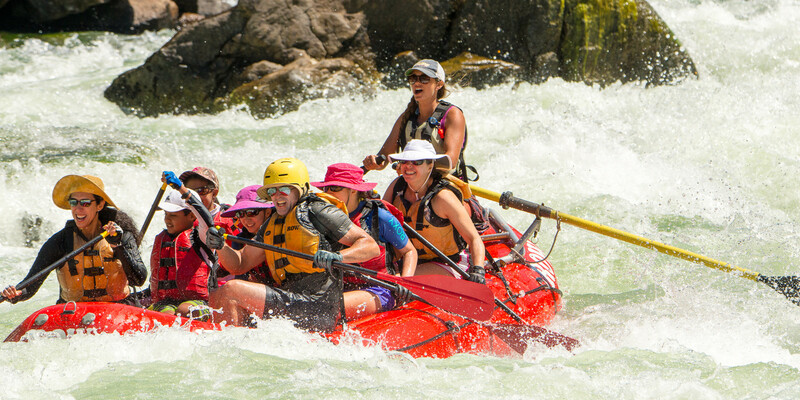 Day trips on the Middle Fork of the Clearwater are a great introduction to rafting and perfect for family trips. In 1968 Congress passed the Wild and Scenic Rivers Act protecting eight wild rivers recognized for their outstanding wilderness, resource and/or water quality values. The Clearwater River along with its major tributaries, the Selway and Lochsa, were among the first eight protected rivers. ROW Adventures is proud to offer whitewater rafting trips on all three of these national treasures. You can choose to ride in a raft or to paddle your own sit-on-top or inflatable kayak. No previous river rafting experience is required for this gentle float trip. The option to stay at the nearby River Dance Lodge makes the Middle Fork of the Clearwater River a wonderful lodge-based family rafting adventure. The Clearwater River is surrounded by the 1.3 million acre Selway-Bitterroot Wilderness, portions of which are a temperate rainforest. Some of the plants found here are also found on Washington State's Olympic Peninsula. A rafting day trip floats you through thick cedar, fir and larch forest, and the riverbanks are overgrown with emerald ferns, spongy mosses, huckleberries and mountain spray. As you paddle, you're likely to see osprey, bald eagles, waterfowl and maybe even a playful river otter. You'll also learn from our knowledgeable guides about the Nez Perce Tribe, the original inhabitants of this land. Traditionally these were rich fishing waters and today you can still see salmon jumping at Selway falls early in the summer. Your rafting or kayaking adventure begins and ends at the River Dance Lodge, Idaho's Outdoor Adventure Resort, situated on the banks of the Clearwater River. Surrounded by spectacular Rocky Mountain scenery and forests of leafy cedar and gargantuan white pine, River Dance Lodge is the perfect all-inclusive vacation resort.